So, the Angels have been waiting for me to tell this story – urging me to tell this story. But they knew it would all come out in due time. You see, the Angels are so patient. So loving. They know that you might falter or slide – or backtrack or even ignore the messages they give you – as I have. But they kept trying with me, like they do for everyone. They don’t give up. They are like good friends who accept the situation you are in without judgement – waiting to step in and help you when you need it, at a moment’s notice… and without being hurt if you should choose to ignore their messages or not follow their guidance. And they are there again the next time you reach out for help. I’ve been so hesitant to open up to and about the Angel community… because I thought I wasn’t good enough. Because I thought that I needed some photographic proof of angelic visitation or some grandiose story about how the angels worked with me and through me. I didn’t have one. I didn’t fit in. All of the others were better – more experienced. They heard more, they saw more, they felt more. They listened to classical music and wore pastels and fit the little mold I had in my head about how people who work with the angels should be. They were calmer and more spiritual. I didn’t even come close to their talent or charisma. I was just me. This negative comparison of myself to others has been a theme in my life. I hung out with some amazingly talented artists when I was in high school. Their art was soooooo good compared to mine, that I knew I didn’t stand a chance as an artist. So I gave up. It was kind of like that – that feeling of being so UN (worthy, talented) and IN (sufficient). Less than. What did I have to offer to the community? To the group? Me – the one who kept ignoring the messages that I was given. Who wanted to control just how I brought my offerings to the table. Who didn’t have an awesome Angel story to captivate people with and let them know, without a doubt, I was one of them. 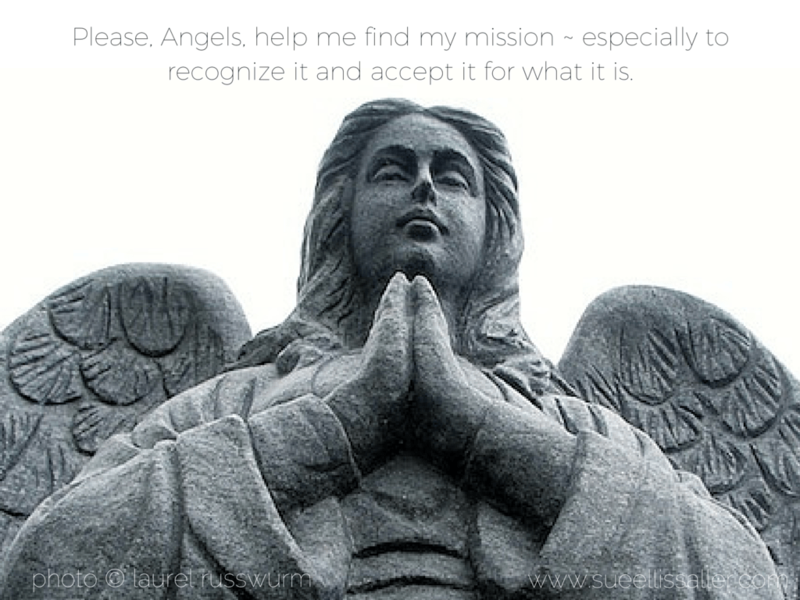 In my life and in my world, the Angels let me know they are there in much more subtle ways – ways that make me laugh and let me know that they heard me asking them to show themselves, but they didn’t want to make a big deal out of it… they wanted to make me smile. And they kept pushing me – to join the community – to reach out – to share… not only card readings or therapy – BUT also with business guidance. You see, when I first got back into working with angels a few years ago, after a long spell of just making it, moving across the world, raising a child on my own, getting married, having more children, etc. – I was working in a partnership as a business development coach. I decided that the angel path/esoteric route was totally the thing for me as it was just such an intrinsic part of who I was, and I wanted to let that part of me be a part of my business persona – I wanted to work with Earth Angels and Light Workers. My business partner wasn’t keen on the idea. I held my ground to be true to who I was and we parted ways. After that break-up, I thought about continuing with helping Light Workers and Earth Angels develop their businesses, but I didn’t pursue that course of action because of a misplaced sense of loyalty to my old business partner. Instead of being true to myself and the direction I was being called in, I brushed it all aside and tried my hand building a tarot and angel card reading business. And that was great for a while – until I started feeling like something was missing. I kept going back to readings because I was good at them… but there was still something missing. They patiently stood to the side and waited for me to accept that it was OK to share all of my gifts. During the time I was working on the readings, I was also building some friendships on the side and actually helping people stay motivated in their businesses. They were bouncing ideas off of me and looking for guidance. They were coming to me not for what I wanted to offer, but for what I was good at. I was already attracting those who needed my help. Naturally. But BUSINESS MENTORING? Business mentoring isn’t really all that angelic, is it? I mean, all of the nuts and bolts of building a business from the ground up… OK… I guess that defining a mission would be angelic and so would figuring out your life’s purpose… but the REST? The technical stuff? The dry “track your accounting” and “register your company legally” stuff didn’t really seem all that exciting at ALL – like it didn’t fit in with the angel community after. You know what the angels told me? Or the message I got that I need to share about this whole thing is? Your talents – no matter what they are – can help other Earth Angels and Lightworkers spread their messages and help to raise the vibration of the Earth IF YOU USE THEM to help the people in the angel community. You don’t have to read cards or be an angel intuitive or healer as your primary “work” in this world. Of course, you might totally enjoy doing those things and continue to offer them as I do – and your experience with them would help you to relate to others in the community – but reading or therapy might not be THE ONLY CONTRIBUTION you need to make to the community. As our community awakens, grows, and expands, there is a need for pretty much every and any help to be brought to the table – whether it is event planning, Reiki attuning, accounting, website development, branding, cooking, health and wellness support – even recommendations for people who do car repairs, tailors, travel agents, etc. We kind of need a little bit of everything that we would encounter in our worlds. So don’t be afraid to bring your specific talent to the table – even if it doesn’t look like what you think it should. There is room for you here. You are loved. You are needed. You are valued – just as you are and for what you have to offer. I finally am ready to use my gifts to help the community in my own special way. Are you? Am I Good Enough to Work with the Angels? I know that many of us face this same fear and self-doubt, Caroline. Glad that I was able to inspire you – and hopeful that I helped a little bit. Thank you for sharing your (very!) inspirational story. Love your website too! Thank you, Michelle! Glad that you were inspired by my story – and glad that you like my site, too! Finally got round to reading this. I love your honesty and the way you told that story really resonated. It’s hard to let go of the stuff you’re good at but really you’re bringing all of those skills and talents into what you do now anyway. It’s true that once we share our gifts, whatever they are, we all become light workers helping each other shine. Indeed we all do have our gifts to share. Thank you for sharing. Thank you, Chanel! It is all about helping each other shine, in whatever way we can!